When the tapas craze swept urban American dining scenes several years ago, some people may have been justifiably wary. Faced with florid descriptions of olive plates and cheese boards, they might have wondered whether the “small plate” concept wasn’t just a clever way to charge a bit more for what was fundamentally an over-dresssed appetizer. Well, tapas, it turns out, have a long and distinguished history, and their staying power over the centuries has more to do with the pleasure afforded by this mode of dining than any crass commercial equation. 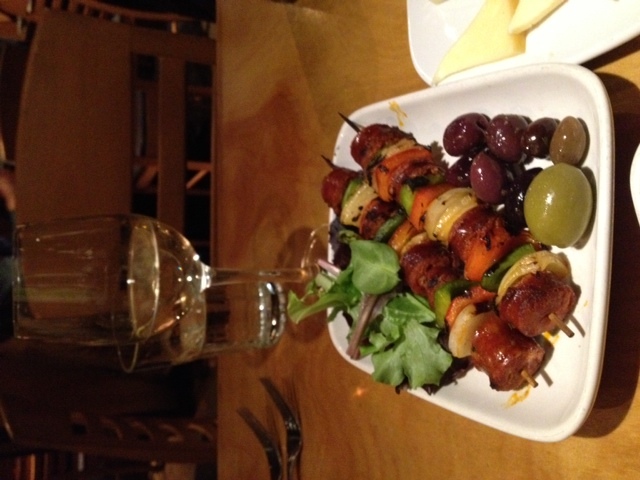 Banderillas - Skewers with Bilbao Chorizo. Fantastic. Whatever derivation of the term you believe (tapas means “cover” and some purport that the etymology derives from people covering their wine glasses to protect from fruit flies or — oddly — sand), sharing a variety of small plates with a few friends is a delightful way to dine, provided the ingredients are fresh, the atmosphere is relaxed and the flavors are inspired. I’ve discovered that these qualities are present most abundantly in those establishments that are truly committed to their small plate menus, as an authentic part of their soul. Unsurprisingly, they tend to be places of Mediterranean, better yet Spanish, pedigree. A quick aside: before I could really enjoy tapas, I had to get over a personal bias. Growing up with a large extended Italian-American brood, I was acculturated to enjoy meals “family style”: huge bowls of pasta and sausage were passed through a rambunctious crowd of gesticulating uncles and cousins, before they were handed back to Nonni (with enough food left for seconds!). It took a while for me to adjust to tapas, with such tiny plates, delicate tastes and implied politesse. My final conversion came last year, when I found myself in Spain, and was able to sample some remarkable Galician specialties: Pimientos del Padron, grilled pulpo, vegetarian broth, and the region’s signature empanadas. Our meals were delicious, hearty, and sociable. Tapas it turns out were not a dainty, trendy way to go hungry. I vowed that when I returned I would scout out the best tapas I could find in Boulder. For over a decade now the place to go in downtown Boulder for many seeking tapas has been the Med, with a large selection of traditional tastes, from roasted garlic to cheeses to fish to dates, prepared in tried-and-true preparations that have in some cases become more serviceable than savory. I tip my cap to the Med for being a trendsetter for Boulder tapas, but for now I’ll be traveling further afield in my tapas explorations. First up on my tapas tour is Da Gabi Cucina, Boulder’s self-professed “Best Kept Secret”. Secrets notwithstanding, before last August I was rarely encouraged to drop into Da Gabi. I think something about its location, nestled behind Lucky’s market in North Boulder, weirded me out. But after moving to the neighborhood last summer, proximity trumped my feng shui folly and I took the plunge. Da Gabi’s Tapas Happy Hour menu is vast and varied. Offerings are arranged by price, with each dish tabbed between $3 and $7. With over 30 dishes to choose from, most served in generous portions, you will require multiple trips to try them all. I wish I could fulfill my journalist’s duty and help you winnow down the options, but having been to Da Gabi well over 10 ten times in the last 6 months, and ordering 4-6 plates a night, I can honestly report that I have never had a disappointing dish. On most nights at Da Gabi, you’ll find General Manager Antonio Rullo energetically presiding over the festivities, with his red hair and large smile. When I asked whether there was a regional focus to Da Gabi’s menu, Antonio explained that the dishes came (mostly) from across Spain, with La Mancha represented by a superb pisto (like a ratatouille), and Moorish spices showing up in the delicious Pinchos Morunos (pork skewers). There are also a few Italian specialties, such as polenta with puttanesca, a bruschetta, and some small “pizzas”, all of which are done with verve and taste. Variety and tradition are well-served, but even in more “standard” tapas fare Da Gabi excels. Two cases in point are the datiles, which present the ubiquitous “bacon-wrapped dates” in their original glory, filled with goat cheese and a Marcona almond, wrapped in Serrano ham and topped with a basil aioli; and the fried calamari, which by virtue of quality squid, an uncommonly light and crispy batter, and a fine San Marzano marinara, will put you off the sports bar version of this dish forever. 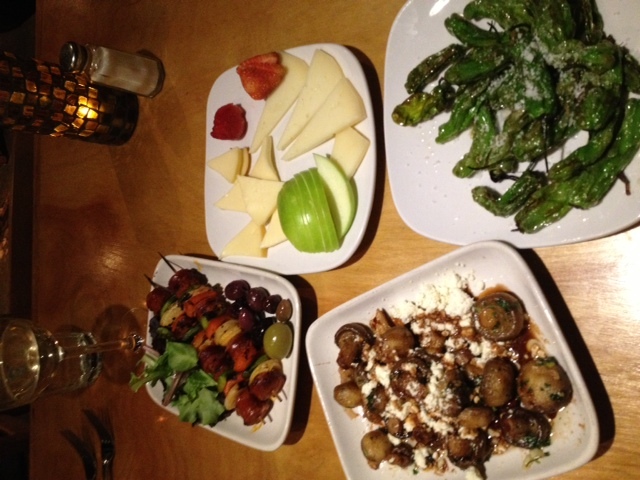 Da Gabi’s Happy Hour tapas menu runs from 5:00-6:30 every night, and all night on Tuesdays. The North Boulder regulars who flock there every Tuesday may kill me for letting the cat out of the bag, but if you want some great tastes of Spain at a great price, grab a friend or three and head over. And don’t be weirded out by the feng shui; it’s actually quite cosy. Excellent article; informative, entertaining and some really good tips. I hear you about growing up with great heaping portions, and then trying to become a grown up, who eats small plates without complaint. It ain’t easy. Fortunately, your description of tapas in general, and pimientos del pardon in particular have me hankering for a tapas trip to Da Gabi to give sensible eating another try. And if I’m lucky, maybe I’ll see you there, lunging for a water glass! I, too, had been meaning to try Da Gabi for years and finally just did. I love a place that I can walk into on a Friday at 5 and find a seat at the bar. 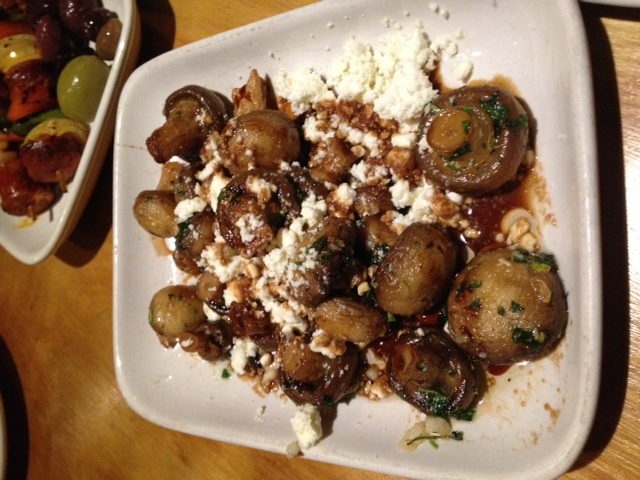 The mushrooms were amazing. Next time I’ll get your Pimientos del Padron. Salud!